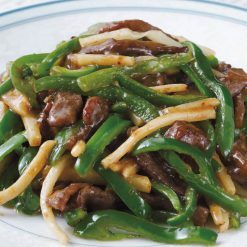 This product, which has lots of umami flavor from oyster sauce, allows you to prepare authentic pepper steak quickly and easily. Enclosed pamphlet contains a recipe for pepper steak, and a recipe for green bean and pork pepper steak stir-fry, or for pepper steak sauce yakisoba, or for John Dory with vegetables and sauce. 160g total (4 bags, 40g each). This Chinese-style sauce can be used with a broad range of ingredients, including meats, seafood, and vegetables. It comes in small, approximately two-serving bags, making it easy to open as many bags as you require servings but not more than you need. Due to the compact size of the bags, you can comfortably keep a reserve of this sauce for whenever you need it. Each 40g bag of Viva Chef pepper steak sauce contains 49mg of calcium. Seasonings such as sauces can be a crucial part of a meal, turning plain food into a delicious experience. After all, sometimes we only think we don’t like certain foods because we haven’t tried them with the right seasoning! Sugarlady’s Viva Chef pepper steak sauce and other seasoning products are safe and free of chemical seasonings and additives, letting the true, natural flavors of the ingredients themselves shine – and allowing you to enjoy your meal without worry. 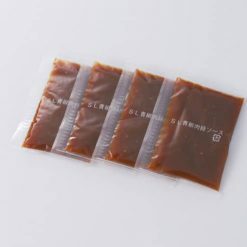 How to defrost: Remove from outer bag and place (still in inner bag) in boiling water to warm and defrost.How to eat: There is a basic recipe (for pepper steak) as well as applied recipes (for green bean and pork pepper steak stir-fry, or for pepper steak sauce yakisoba, or for John Dory with vegetables and sauce) on the enclosed pamphlet.1 bag of Viva Chef pepper steak sauce should be used for approximately every 2 servings of food you are preparing. This product contains rice wine for cooking, soy sauce (contains wheat), sugar, oyster sauce, rice starch, sesame oil, garlic, ginger, apple cider vinegar, doubanjiang, milk calcium, yeast extract.. This product is not suitable for anyone with allergies to milk, wheat, soy, apple or sesame.